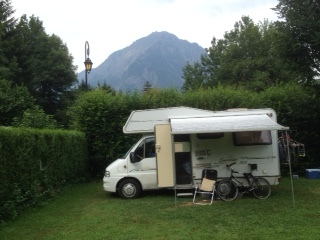 I’m up in the High Alps, Bourgeois d’Oisans, the centre of the cycling universe! Am sure you’ve been here yourself and of course everything is in preparation for the TdF which comes through next Thursday, 23rd. I don’t often get good wifi but it’s ok here. 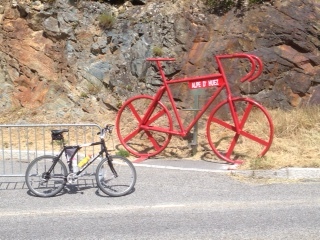 I had a few days down in Provence – Bedoin – to do Mont Ventoux the conventional way which was ok, despite there being hundreds of cyclists churning their way up! Was going to do it the next day a different route and got a few miles up when the rear dérailleur on my Trek gave up the ghost, fell apart, chain snapped etc. so a longish walk/ scoot back to camp. Was touched by the number of cyclists who stopped to see if I needed help – one Dutch guy even offered me an emergency chain link to get back. Wasn’t too far though. The bike has done well over 2 months I suppose and is going to need a whole new drive train so I thought I would wait til I get home to get it done and switch to the MTB. Nobody rides a Trek over here and with one busy bike shop in the village it would be an expensive wait for parts I guess. 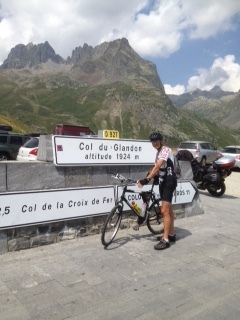 So I came up here to do some of the TdF passes. 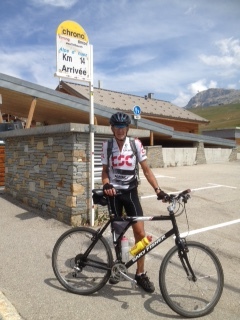 Did the Alpe d’Huez the other day along with hundreds of others and yesterday the Glandon and Croix de Fer. Done them all before but not on a MTB which I have to say was fun. When you’re churning uphill, those extra gears are pretty handy. I am amazed how many riders are doing these passes with a compact and rear cassette with too high a ratio – hardly moving some of them. You’ve got to spin up in my book. Need a front 50/34 and 32 rear at least which of course a MTB will have. Anyway, the motor-homers have already moved in to “bag” the best lay-bys and viewing spots; some have already been here a week! 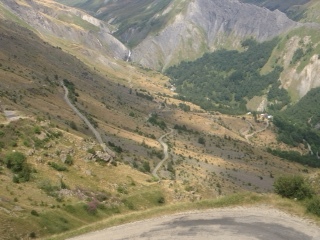 The gendarmes are being a bit stricter this year and insisting that up the Alpe you can only park on some bends and you have to face downhill – to avoid the million point turns that have to be made to get down I suppose. Phil’s home for two months! The roads maintenance people are out mending guard rails, resurfacing, cutting back verges and sweeping. 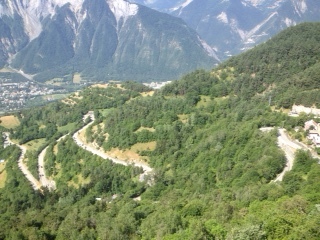 (Makes me think we need a couple of TdF stages in UK every year to put our roads right!) And there are a host of road closures and deviations coming up so I have to keep an eye those ‘cos I have a date with Mr. Froome up in Paris for the Champs Élysées finish next week and I don’t want to get grounded / hemmed in and stuck here! I’ll be back for the London-Surrey 100; great to think CTC Northampton has at least six riders in it – almost a TdF Team peloton! 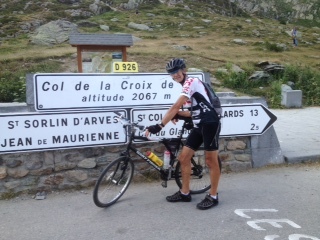 Don’t forget: you can sponsor Phil in the London-Surrey 100 here! He’s using his place to raise funds for Headway Northampton. with cyclists. At nearly 30 miles we were ready for the bacon butties on offer especially as the route had been quite hilly as well. was all downhill (well nearly). lanes had been very quiet. time to watch most of the Tour. At least six riders from CTC Northampton are taking part in the London-Surrey 100 on Sunday 2nd August. This is a 100-mile ride on closed roads that follows the route of the 2012 Olympic Road Race, starting at the Olympic Park in Stratford, going out to the Surrey Hills and returning to London to finish on The Mall. Four CTC Northampton riders were successful in the public ballot for places: Brian, Colin, Emily and Phil L. Two more are taking part in teams from clubs affiliated to British Cycling: Phillip G is riding with Team MK and Ian M is riding with Forty-Plus CC. Two riders have decided to use the opportunity to raise funds for charities. Colin is seeking sponsorship on behalf of the Junior Diabetes Research Foundation. This is a charity dear to him as his daughter has had diabetes since she was four. You can help the charity through Colin’s webpage where he appears as Danny Lopez (a character in Dylan’s song “Something There Is About You” from the album “Planet Waves”)! Phil L is seeking sponsorship on behalf of the Headway Foundation which supports those with brain injury in Northampton. This is a charity dear to him as he sustained a serious head injury himself when he fell from his bike in March last year. It is also the charity we support in our annual Guy Barber Ride. You can help through Phil’s webpage (Phil doesn’t appear as a character from a Dylan song! ).